ECS PF88 Extreme PCSTATS Review - Versatility is the key to the ECS PF88 Extreme! Versatility is the key to the ECS PF88 Extreme! Whenever I tell people that upgrading computer hardware is not as simple as software upgrades, I often get the response "why?" I guess this shouldn't be much of a surprise since most people are used to having a great deal of flexibility with their computers. As the computer tech for my circle of friends and family, I have seen some mind-boggling things such as trying to fit a Socket A AthlonXP into a Socket 370 motherboard and the common DDR-memory-in-SDRAM-slots act. The general public simply doesn't know that the underlying hardware technology of each competing processor and memory type is completely different and not compatible. 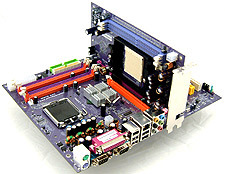 We're happy to see that ECS is trying to break this trend with its brand new PF88 Extreme motherboard. By default the board supports Socket 775 Pentium 4 processors, but if you fancy a change, install one of the several SIMA cards and put an Athlon64 in it! For the first time since Socket 7 was the platform for both Intel and AMD, ECS has put together a motherboard which is compatible with almost every processor and memory subsystem on the market. Of course this requires users to go out and purchase the special SIMA cards, but at $50 a pop (plus the cost for all the other necessary hardware), this can be a very affordable upgrade! Standard hardware features of the motherboard include IEEE 1394a, a 7.1 channel audio controller, Gigabit LAN, a wireless USB 802.11G NIC and a Serial ATA II/RAID controller. The PF88 Extreme comes equipped with a lot more goodies than the usual ECS motherboard, and that's something we're happy to see. The motherboard itself was quite easy to use aside from the Elite bus jumpers. Should you need to refer to the manual, ECS has done a good job at explaining things from hardware settings to BIOS and even how to configure the SiS Serial ATA RAID controller. In our experience, SiS chips usually run quite cool but the ones on the PF88 Extreme ran like little infernos. The system was completely stable, but still you'd probably want some good airflow passing through your case. About the only thing I have to complain about is having to switch jumper settings when using the SIMA cards. As it is, ECS requires users to move two sets of twelve small black jumpers and believe me when I say it's very easy to misplace them! ECS should definitely include a few extra with its retail motherboards! 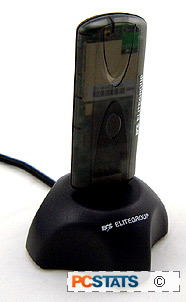 The performance of the ECS PF88 Extreme when using a Pentium 4 540 was mediocre at best, often coming in last in the various benchmarks. To be fair though, the board is targeted towards the mid-level desktop market and in that case I'd say the PF88 Extreme did pretty well. On the AMD side of things, performance was much closer since AMD integrates the memory controller onto the processor. In fact in many of the benchmarks, the ECS PF88 Extreme performed on par or slightly faster than its nForce4 Ultra/SLI counterparts! The ECS PF88 Extreme is not quite ready for prime time yet and thus we do not know the MSRP. Still if you're looking to upgrade in the near future and want some flexibility, the ECS PF88 Extreme is a totally unique solution that earns high marks from us for its innovation. In the motherboard game it pays to brake new ground, and this is exactly what the ECS PF88 Extreme does. The benchmarks show that performance is quite good, though not top of the line, but coming from a board that does so much that is perhaps even more remarkable. Pg 19. — Versatility is the key to the ECS PF88 Extreme!